HTML5 is being touted as the future of the web and the Hearst Corporation has taken notice by announcing that they will be re-launching all of their websites with extensive HTML5 use. 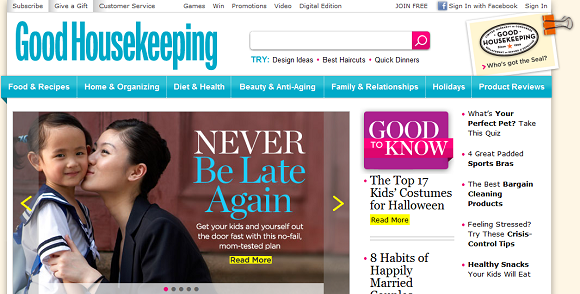 According to Hearst the first website to receive a full makeover is the 126-year-old Good Housekeeping which is to be followed by all of the other properties Hearst acquired when they took over publisher Hachette in early 2011. It’s believed that the company will have re-launched their entire portfolio in HTML5 within 6-18 months. With the relaunch Hearts properties will all feature touch-screen elements. The first example of the new HTML5 capabilities being utilized by the company comes on the homepage of Good Housekeeping where the slide show feature can be manipulated by a mouse click via PC and through touch when accessed on tablets and smartphones. Hearst isn’t the first media organization to embrace HTML5 standards, The Financial Times and The Boston Globe have already converted their flagship websites to the new technology. Take a look at the Good Housekeeping website and let us know what you think.